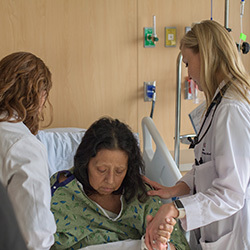 Through thorough assessment of the educational needs of our learners at all levels, our department creates and/or enhances educational opportunities department-wide, identifying the needs for faculty development for clinician-educators. Taking advantage of our strong partnership with faculty across the clinical divisions/institutes at the UA College of Medicine – Phoenix, Banner – University Medical Center Phoenix and the Phoenix VA Health Care System, as well as within our many training programs, the department is in relentless pursuit of innovative ideas to implement and study the effectiveness of programs that will train our learners for the future of internal medicine. This is accomplished by planning, implementing and studying innovative educational programs throughout the department, creating or providing resources for teachers at all levels (resident, fellow, attending) and partnering with college resources in faculty development. For Graduate and Undergraduate Medical Education. Department of Medicine Weekly Grand Rounds – Our grand rounds program provides a traditional format for gaining medical knowledge and clinical skills, yet is designed with the modern learner in mind — from medical students to faculty. These CME-eligible sessions offer content from all disciplines in medicine, providing opportunities for local content experts, as well as nationally and internationally known speakers. Sessions are interactive, relevant and up-to-date.